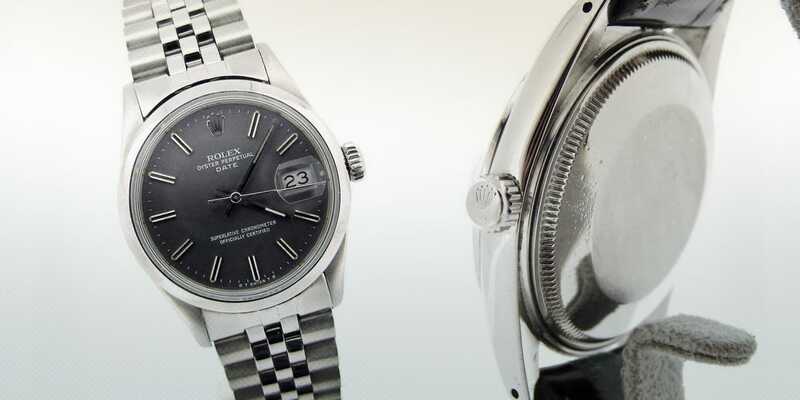 The Rolex Date is another watch in the Rolex line that is seen all around the globe. As a slightly less expensive model as the DateJust, many people have found this great timepiece as wearable and enjoyable as its more expensive counterpart. This video will show you how to set the time, the date, and how to wind the watch while keeping the Oyster Case’s waterproofness. This is a men’s Rolex Date model reference 15000; this is the Quickset model. I am going to show you how to set the date, set the time, and wind this Rolex. First the position that it is in is its’ wearing position that’s where it is screwed in all the way. Okay, this is how you keep the watch water tight when it is on your wrist. Now when you first receive the watch, or if the watch has not been worn for more than a few days, we’re going to want to manually wind the watch to fully charge the movement, and this is done by going to gently unscrew the crown counterclockwise to where it unthreads. Then in a clockwise motion we’re going to wind the watch approximately 20-40 full turns. What this is doing is fully charging the movement. Next, what we’re going to do is we’re going to set the date. We’re going to gently pull the crown out to the next position… and we’re going to counter-clockwise set the correct day. Since today is the 6th, we’re going to go one more time. And now we’re going to set the time. Gently pull the crown out to its’ last position of course out from the watch so it separates. Now we’re going to set the correct time to actually 7:40. Now we’re going to push it back in and turn up so it locks in. This is your wearing position. Now you are ready to wear your watch and enjoy.